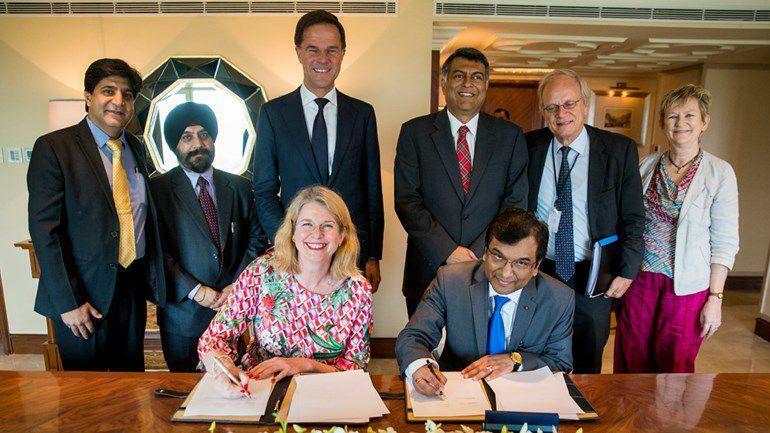 During the Dutch trade mission to India from 22 -25 May 2018, several results were announced as part of the structural cooperation between The Hague and India. The foundation for this cooperation with India was laid two years ago during a visit of a Hague delegation led by alderman Karsten Klein. The Dutch trade mission in May 2018 was led by prime minister Mark Rutte. 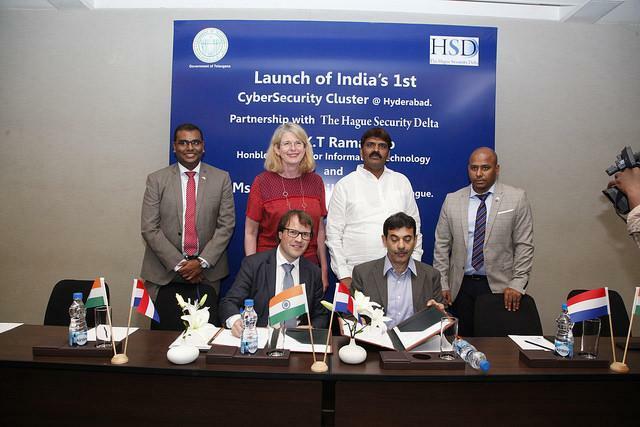 The Indian tech giant HCL announced the establishment of a Center of Excellence on Cyber Security in The Hague in the presence of Prime Minister Mark Rutte and The Hague mayor Pauline Krikke. With approximately 120,000 employees, HCL is one of the larger players in the field of cyber security. Their European headquarters are already in The Hague. The acquisition is a joint effort and succes of the close collaboration between Netherlands Foreign Investment Agency (NFIA), The Hague Business Agency, InnovationQuarter (IQ), City of The Hague and HSD Office. The initial dialogue about setting up a Centre of Excellence on Cyber Security took place when HCL invited a small delegation led by HSD to talk about trends in cyber security, half a year ago. It was during this meeting when The Hague was mentioned as logical place to set up such a centre, because of amongst others the presence of HSD. "The Centre of Excellence underlines the position of The Hague as one of the leading (cyber) security clusters in Europe. In India I have noticed that there is a lot of interest in what we are doing in the Hague in the area of cyber security. In addition, The Hague is an attractive partner and location for the Indian IT sector because of its positioning as the international city of peace and justice, as a government city and as a city with many knowledge institutions and international organisations. It is good to see how the cooperation that was started a few years ago already leads to new initiatives and good results." In addition to the announcement of the expertise center for cyber security, Mayor Krikke -in the presence of Prime Minister Rutte- signed a Letter of Intent to investigate with HCL the conditions for setting up a broader Innovation Center of Excellence. This second centre focuses on solving societal issues of cities in areas such as security, mobility and the use of public space through digital innovation, IT and the use of data. During the trade mission a ‘programme of cooperation’ (PoC) between Hyderabad Security Foundation (HSF) and The Hague Security Delta (HSD) was formally signed by IT secretary Jayesh Ranjan and Joris den Bruinen, deputy director HSD, in the presence of the Mayor of The Hague Pauline Krikke and the Mayor of Hyderabad Bonthu Rammohan. The signing took place during a key stakeholder meeting with an eight-member delegation from The Netherlands comprising Mayor of Hague, officials from HSD and Dutch companies working in the field of cyber security. During the key stakeholder meeting, Commissioner of Police, Anjani Kumar said Hyderabad police was keen on collaborating to gather inputs from HSD for capacity building, use of cyber forensics like face recognition, neighbourhood surveillance and traffic management. Mayor of Hague, Pauline Krikke extended an invitation to the 22 founding fathers, IT secretary and the police commissioner to visit HSD during the Cyber Security Week in October. Read the Indian news article. In the presence of Mayor Krikke, an agreement was signed with the Indian states of Karnataka (Bangalore) and Telangana (Hyderabad). The agreement states that i.o. The Hague will help Indian start-ups with exploring the European market as part of an 'India - NL Softlanding Programme'. On the other hand, Indian organisations will support Dutch companies in India. The Softlanding Programme is an agreement with the Centre of Excellence of the Indian state of Karnataka. It was also agreed that IT students from both Indian states will follow a Summer School on cyber security in The Hague this summer. The intention is to bring a number of Indian students to The Hague every year. The municipality of The Hague and partners in India will therefore work even more closely in the further development of cyber security. "Hyderabad (11 million inhabitants) was looking for inspiration in many places in the world in order to realise their ambitions. 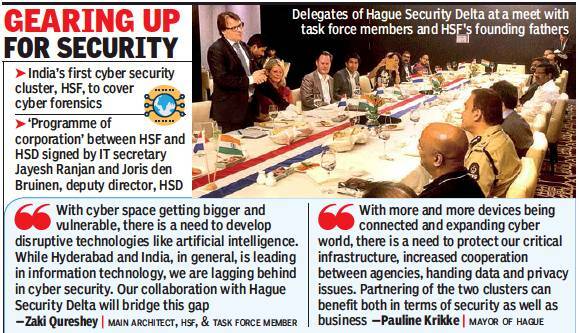 In the end, The Hague served as a model for cooperation between governments, businesses and knowledge institutions within The Hague Security Delta (HSD), leading to the establishment of their own Hyderabad Security Cluster (HSC). Something to be proud of as The Hague and the Netherlands." More information about the trade mission and the joint statement released after the talks between PM Narendra Modi and his Dutch counterpart Mark Rutte. The Cyber Security Track was part of the high Tech/ICT programme.